Alton Towers Resort, commonly referred to as Alton Towers, is the UK’s leading tourist attraction located in the county of Staffordshire. Alton Towers consists of a theme park, water park and hotel complex and major attractions include Nemesis, Oblivion, Air, Runaway Mine Train, Congo River Rapids, Hex – The Legend of the Towers and TH13TEEN. 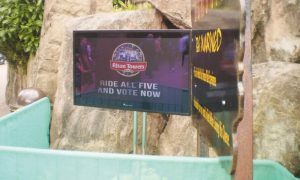 Alton Towers have installed Aqualite outdoor TV screens to manage queues at five of their largest rides ensuring that those people who are queuing up for the ride will see the latest promotions from the venue. Digital signage enables them to reach consumers at different touch points during the day and change the messages as and when they want to making static billboards a thing of the past. 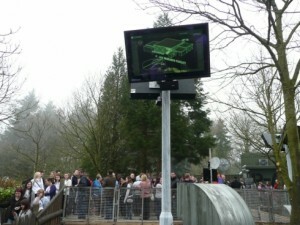 Marc from Napa Technology Ltd – who installed the screens – commentated “as we all know we have to expect rain at some stage during the British summer and the weather is really fickle at Alton Towers; with the Aqualite LCD screens IP66 rated we had peace of mind regardless of the conditions. With the unpredictability of the weather being a major problem for outdoor events, many organisers are turning to outdoor screens to keep visitors informed. For example the BMW PGA Golf tournament at Wentworth used four 42” Aqualite screens positioned throughout the hospitality village allowing the spectators to stay in touch with the action when away from the course.